Shadow can be advanced and has +1 strength for each advancement token on it. subroutine The Corp gains 2credit. subroutine Trace – If successful, give the Runner 1 tag. Shadow is one of my personal favourite 'bad' cards. Firstly, why do I like it? As an early game ice rez, it typically fires its subs and so the Corp gets 2 back (for a net rez cost of 1), and then the runner will have to pay a couple of credits on the trace or clearing a tag shortly afterwards. Overall, a nice credit swing result from rezzing ice. Also, once rezzed on a central server or taxing 'asset' remote, a runner will rarely make a normal run through it before getting a killer out to deal with it. And even once the runner has a killer out, they're probably spending 2 to break this every run, regardless of what killer it is. Also, on occasion a runner will get careless and run through a Shadow on last click without a killer, letting you land a killing tag. (But sadly, this scenario is extremely rare). However, Shadow has one really big problem. If the runner wants to make a high-value run, such as The Maker's Eye, Legwork, Wanton Destruction or Account Siphon, they'll often be happy to just run right through Shadow. Also, once the runner has a killer installed, the net rez cost is the full 3 which is not great for the small tax it provides. Advancing Shadow is rarely worthwhile. The most likely scenario of triple advancing it to strength 4 to mess with Mimic is still hard to justify - the Corp has spent a hefty 3 clicks and 3 credits, now the runner can still just run through it and clear the tag afterwards if they really need to. There is one ID where Shadow performs clearly best, and that is Tennin Institute. With a tiny 1 inf cost, it is affordable advancable ice along with Ice Wall to support Trick of Light. Also. its low net rez cost is perfect for setting up early game defenses, and ongoing tax is good for grinding down the runner. Shadow is an underused piece of ICE. 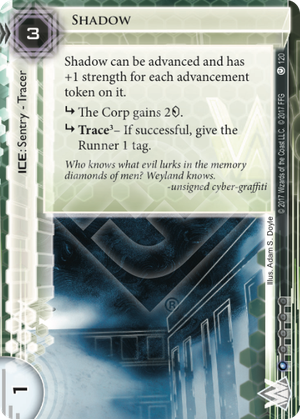 In faction tagging is extremely good for Weyland, but that comes on the price of it being ICE - Subroutines rarely fire more than once, and certainly not a second time without the runner being prepared for it to do so. Shadow however, is advanceable. This means that even if the runner isn’t going to hit it, they may not be able to run it if they don’t want the tag. Runner is using Mimic as their primary killer? Then triple advanced and this card means the runner now has to deal with a trace five (From the free two credits) to avoid a tag, or waste a click every time they want to run through it. A Builder in front of it can suddenly put it out of the runner’s reach to break, and of course Corporate Troubleshooter can really put the subroutines back into effect. Still, tags from ICE are harder to land, more often needing on encounter effects (Data Raven) or simply being that it is more effective to take the tag and clear it afterward, for being too expensive to avoid in the first place (Gutenberg). Shadow is however, in faction for one of the most potent forms of tag punishment, and that makes it dangerous - if underused.